Like most things in life, I came across The Club by chance. I was in the second week of my artist residency in Salt when my host, Carme, shared with me her involvement with volunteer organization Traçant Camins and extended an invitation for me to come and help out at The Club. The Club meets daily from 4pm to 6pm at an annex area in Centre d'Acolliment La Sopa. La Sopa, which has been in existence for over a hundred years, is located beside the Girona Cathedral at the centre of the old town. 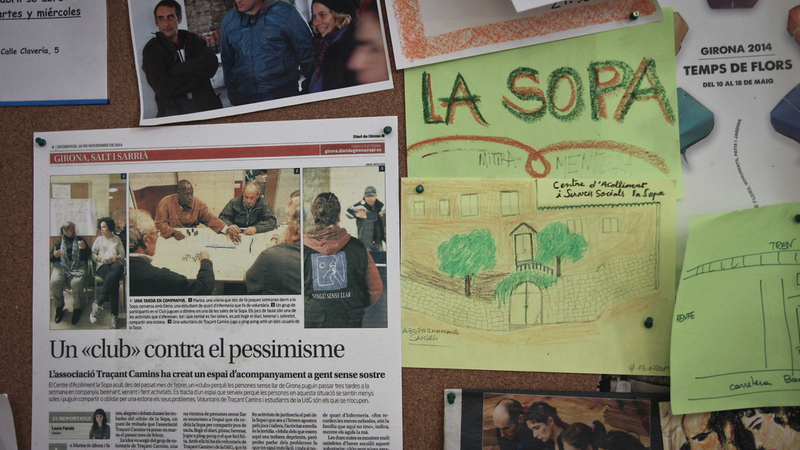 The Club of Traçant Camins is a means for individuals housed at Centre d'Acolliment La Sopa and others living without permanent shelter to meet and socialize. For two hours each day, members of The Club engage by playing games. Snacks and coffee are provided for them at 5pm each day. I spent several afternoons observing and documenting them and I noticed a group of people around a table focused on sheets of paper in front of them. Upon closer inspection, I realized that they were colouring mandalas of various shapes and sizes. I could not communicate with most of them verbally as I did not speak Catalan and most of them did not speak English. However, we all knew how to fill shapes with colours and hence this act of colouring seemed like a good place to start. I sat down with them and started to make fragmented bits of conversation through a mix of interpretation and gesturing. Parts of these fragments were documented and edited into a short video that hopes to capture the energy behind this exercise of colouring mandalas and communication. Three weeks is a relatively short time to build relationships, but I was fortunate to have encountered a group of people who were exceedingly generous with their energy and time. I have to confess that I have barely had time to develop these friendships before it comes time to bid goodbye with the conclusion of my residency. This exhibition is dedicated to the various individuals I have met at The Club of Traçant Camins.